I imagine you’re all familiar with the saying “boots or no boots” but when our reserve team travelled to play Oram in the first round of the Platinum Tanks reserve football championship (Crawley Cup) on Wednesday 3rd May it was a case of “jersey or no jersey’s” because the lads had to play the first half of this encounter with a selection of training tops & old jerseys after a little misunderstanding! 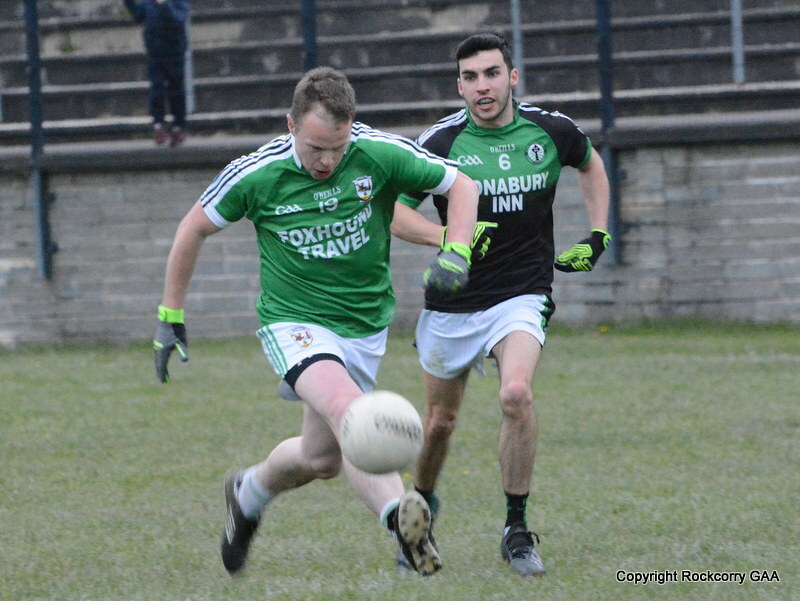 When these two sides clashed two weeks ago in the league campaign Oram clinched a vital win by a five points and they showed their determination and intent from an early stage and were quick off the mark with a point after forty seconds and three more followed in quick succession to lead 0-4 to 0-0. Our first score came on the 8th minute with Garry Thornton displaying some wonderful high fielding he off-loaded to Keelan Clerkin who delivered a measured pass to Martin Carroll and he finished in style. Oram, who had the aid of the elements during the first half, notched over two more points and this was unfortunately followed by a goal to take a healthy 1-6 to 0-1 advantage after fifteen minutes. 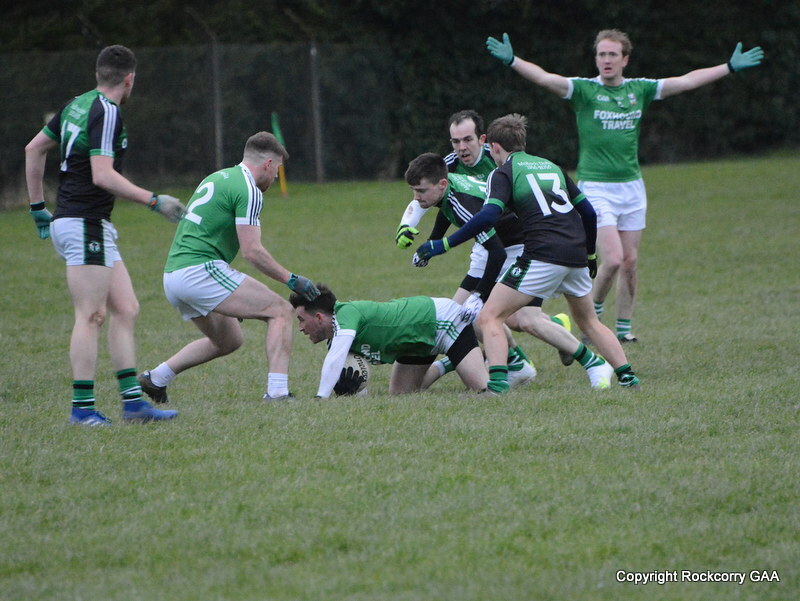 Dwayne Rooney pulled a point back, on the 18th minute, following good work by Keelan Clerkin and Garry Thornton and when Lorcan Smyth was fouled on the 24th minute, he dusted himself down and coolly converted the free-kick to leave the score 1-6 to 0-3. Oram were quick to answer and fired over a neat point but with half time approaching we finished strong with a tidy finish from Lorcan Smyth, on the 27th minute, and Martin Carroll completed the scoring with a splendid effort to leave the scoreboard showing Oram 1-7 Rockcorry 0-5 at the interval. After the “mix-up” with the jerseys it was a revamped outfit in green & white that took the field for the second half and the lads dominated virtually every position on the field and comprehensively outplayed their opponents with a combination of outstanding teamwork and some skilful individual play. While we kicked three wides during the first five minutes Dwayne Rooney broke the monotony when he converted a free-kick on the 8th minute and Garry Calvert, who by the way played with a broken nose, showed his accuracy with a terrific finish following good approach play by Martin Carroll and Lorcan Smyth. Anything he can do I can do better….and when Anthony Tate collected the ball on the 12th minute he split the uprights with a lovely curling effort after Cathal Sheridan and Keelan Clerkin did all the hard-work down the right wing and Dwayne Rooney closed the gap further with a fabulous score from a tight angle to reduce the deficit to just a point, Oram 1-7 Rockcorry 0-9. Oram opened their account, on the 16th minute, via a delightful finish to stretch their advantage but during a five minute spell, which we dominated, the game turned in our favour with two goals. Admittedly the first goal was slightly fruititous but one that was certainly very welcomed and it arrived on the 20th minute when the crafty Lorcan Smyth delivered a long ball into the goal-mouth area and it was misjudged by the Oram goal-keeper and fell into the back of the net. 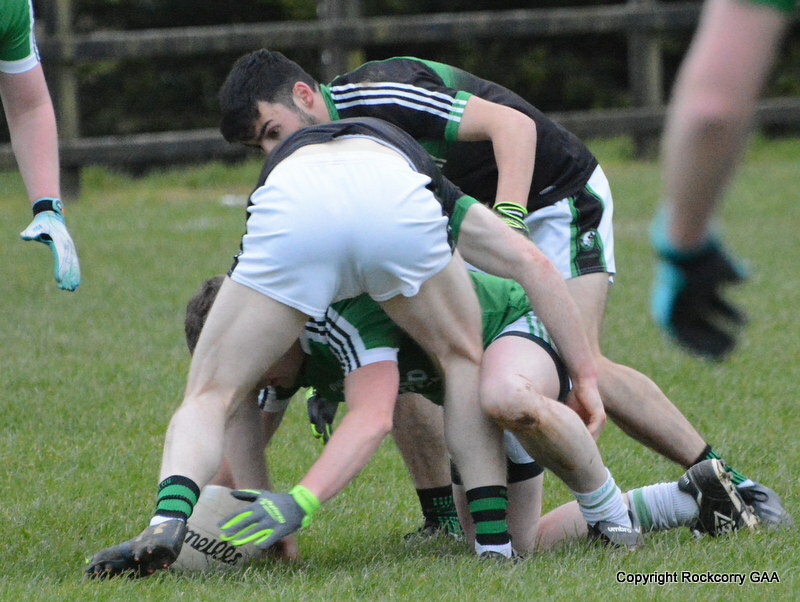 (After the game Lorcan maintained that he saw the goal-keeper off his line and it was a perfect lob…off course we believe him!!!) If there was a tiny bit of ‘lady luck’ associated with our first goal there can be no dispute or squabble with our second goal because Keelan Clerkin rounded off a flowing move, that involved Andrew Carroll & Anthony Tate, with a clinical finish past the Oram goal-keeper to put us ahead by four points, leading 1-8 to 2-9. Oram recovered well and scored three unanswered points to close the gap back to just a single point and they perhaps should have taken the lead moments later but they missed scoring opportunities on the 27th and 28th minutes albeit under severe pressure from our defenders. 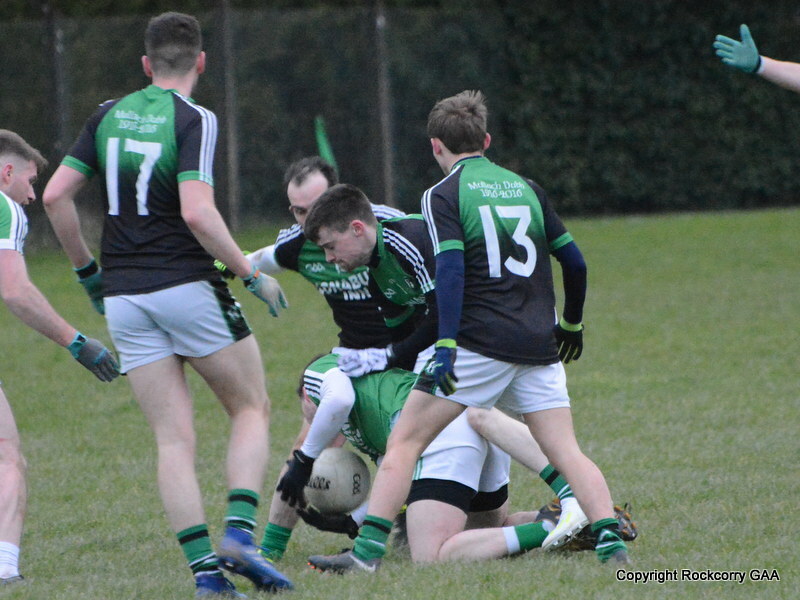 The game was now in the proverbial melting pot and in fairness could have gone either way but our lads showed great heart, conviction and their willingness to put their bodies on the line ultimately won this game. With only seconds remaining of normal time Dwayne Rooney slipped past two tackles and delivered a monstrous point to put us two ahead and a couple of minutes into injury time he tacked on another point from a free-kick after a foul on Martin Carroll to leave the final score Oram 1-11 Rockcorry 2-11. 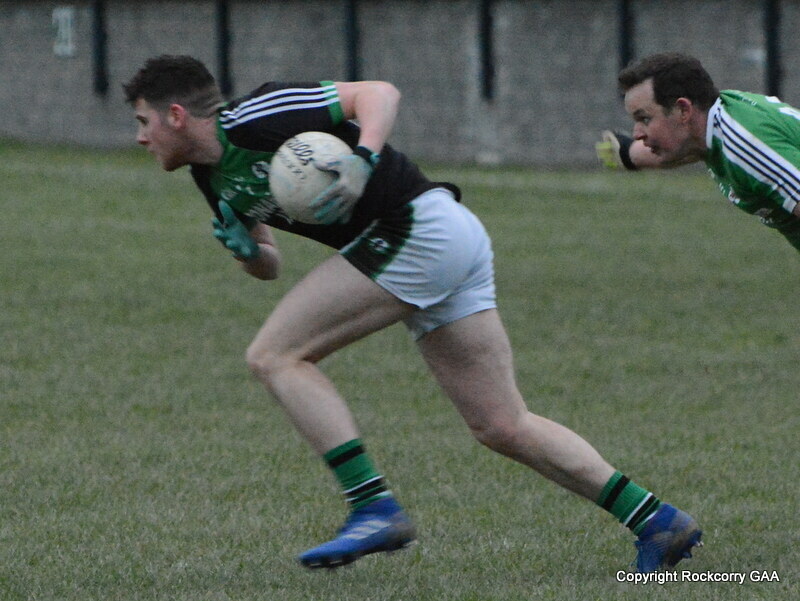 Team & Scorers: Dean Fay, Cathal Sheridan, Rory Carroll, Ciaran O’Hart, Corey Smith, Keelan Clerkin (1-0), John Greenan, Martin Carroll (0-2), Garry Thornton, Christopher Greenan, Garry Calvert (0-1), Andrew Carroll, Lorcan Smyth (1-2,1f) Dwayne Rooney (0-5, 2f), Aaron Clerkin. Subs: Anthony Tate (0-1) for Andrew Carroll, Andrew Carroll for Christopher Greenan, Kyle Rooney for Aaron Clerkin.